Richard STRAUSS: Salome (1905). Cast includes: Nadja Michael, Michaela Schuster, Thomas Moser, Joseph Kaiser, Michael Volle. The Orchestra of the Royal Opera House, Philippe Jordan (cond.). Opus Arte OA 0996 D (2 DVDs) (http://www.opusarte.com/). Distributed in the US by Naxos (http://www.naxos.com/). With a knowing nod towards Pasolini’s Salò, David McVicar (director) and Es Devlin (designer) have set Strauss’ luscious single act (and last avant-garde salvo) in a high-ceilinged, multi-purpose cellar whose dingy tiles and fittings suggest a kitchen, showers, or more appropriately, an abattoir. At the proscenium’s top we catch glimpses of Herod partying on an upper floor. The sets change only in the Dance of the Seven Veils when the walls and doorways fall and glide away. As the opera’s high point, Salome, instead of stripping down, exchanges one layer for another. The consistently arresting images emphasize awkward motivations: Why does Narraboth, the smitten guard, kill himself so precipitously? Why is Herod alternately potent and paranoid? (Well, that one’s easier to understand.) This production makes clear that both Salome and Herod are plagued by desires that cannot be consummated. The blunt violence and sexuality are excessive. Why must the executioner be naked to accomplish his task? (Donatello’s bronze David comes to mind.) Once Salome acquires her souvenir, there’s blood everywhere, to the point of distraction. On the other hand, had you wished Strauss’ style maintained its chromatic leitmotivs and expressive tonality rather than creeping towards Mozart, you’ll approve the orchestra’s sometimes drowning out the singers when they drift from front and center. The second DVD offers a fine documentary on the production’s creation. Nikolai RIMSKY-KORSAKOV: Le Coq d’Or (1907). Cast includes: Albert Schagidullin, Ilya Levinsky, Andrei Breus, Alya Bannik, Elena Manistina, Barry Banks, Olga Trifonova, Yuri Maria Saenz. Chorus of the Mariinsky Theatre, St. Petersburg, Orchestra de Paris, Kent Nagano (cond.). TDK DVUS-OPLCO (DVD). Distributed in the US by Naxos (http://www.naxos.com/). Rimsky-Korsakov died in 1908 without ever seeing Le Coq d’Or staged. The state censor banned the composer’s update of Pushkin’s 1834 poem to satirize Russian incompetence in the 1904-06 war with Japan. Ennosuke Ichikawa’s production employs the rich language of Kabuki for this “fairy tale with a moral.” Fantastic costumes, a minimal though boldly lit set, and the singers’ gestures and make-up combine to enthralling effect. An astrologer brackets the opera proper, predicting a fantastic story. We meet a king tired of his warring neighbors. The astrologer appears, and gives the king a golden cockerel that will crow as threats impend. The astrologer defers compensation, preferring to name his payment sometime later. The bird’s alarms send the king and his sons into battle with disastrous results. The enemy queen seduces the king and on their wedding day, the astrologer asserts his claim and demands to marry the queen. The king kills the astrologer, and in revenge, the golden bird kills the king. The astrologer reemerges to say only he and the queen were real. The vocalists are splendid, and the Paris Opera’s playing is superb. Its three acts passing in 108 minutes, Rimsky-Korsakov’s trim opera offers his characteristic exotic touches. 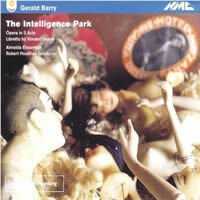 Gerald BARRY: The Intelligence Park (1981-1990). Cast includes: Richard Jackson, Paul Harrhy, Stephen Richardson, Angela Tunstall, Nicholas Clapton, Buddug Verona James. Almeida Ensemble, Robert Houlihan (cond.). NMC D122 (2 CDs) (http://www.nmcrec.co.uk./). Distributed in the US by Qualiton (http://www.qualiton.com/). 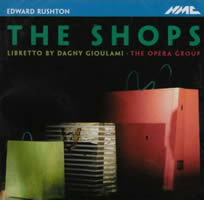 Edward RUSHTON: The Shops (2006). Cast includes: Darren Abrahams, Anna Dennis, Phyllis Cannan, Richard Burkhard, Louise Mott, Paul Reeves. The Opera Group, Patrick Bailey (cond.). NMC D146 (http://www.nmcrec.co.uk./). Distributed in the US by Qualiton (http://www.qualiton.com/). In The Intelligence Park, an uninspired composer falls for a castrato instead of an intended heiress. He regains his creativity, and the castrato and heiress fall for each other. Set in 1753 Dublin, the plot includes an eclipse and other period references as the plot’s logic intentionally fractures as the action progresses. Barry’s buoyant writing includes set pieces much like opera seria. The composer’s multi-year laboring suggests more going on than can be discerned from a conventional recording. The 15 players sound like many more (additional voices are on tape), and are evidently energized. The production clearly warrants a DVD. The Shops offers a compact and knowing look at collectors and their obsessions, centering on a stamp burglar who is caught, tried and psychoanalyzed. Dagny Gioulami’s libretto is clever and spirited, and the ensemble capably shifts roles to deliver its vivid story. Rushton’s music burbles below, modern but not fiendish. I can see small opera troupes picking this up to everyone’s satisfaction. Mark-Anthony TURNAGE: Greek (1988). Cast includes: Quentin Hayes, Fiona Kimm, Richard Suart, Helen Charnock, Richard Chance, Barry Holland, Roger Monk, David Ruffin. The Almeida Ensemble, Richard Bernas (cond.). Arthaus Music 102 105 (DVD) (http://arthaus-musik.com/). Distributed in the US by Naxos (http://www.naxos.com/). Commissioned by Henze for the Munich Biennale, this splashy update thrusts Oedipus into a decrepit, late-1980s London. The singers are good. If only the music and this staged-for-TV production were different. 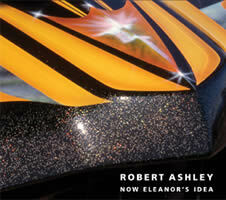 Robert ASHLEY: Now Eleanor’s Idea (1993). Cast includes: Joan La Barbara, Amy X. Neuberg, Marghreta Cordero, Robert Ashley, Sam Ashley, Thomas Buckner, Jacqueline Humbert. Lovely Music LCD 1009 (2 CDs) (http://www.lovely.com/). 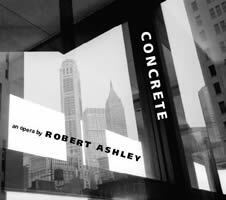 Robert ASHLEY: Concrete (2007). Cast includes: Sam Ashley, Thomas Buckner, Jacqueline Humbert, Joan La Barbara. Robert Ashley, Tom Hamilton (orchestral samples, live mixing and processing). Lovely Music LCD 1010 (2 CDs) (http://www.lovely.com/). Now Eleanor’s Idea celebrates New Mexico’s lowriders, artists whose elaborately decorated cars advertise their religious beliefs. Over a gentle computerized wash, spoken and sung voices (in English and Spanish) relate quickly passing events including a bank robbery, a TV show, and cars and their drivers. Listeners already won over by Ashley’s mesmerizing streams will find familiar performers as well as a perky pace across the four acts’ 90 minutes. The plot centers around the life change of its main character, Now Eleanor, who leaves her job as a bank teller to construct a documentary about lowriders. The more obscure Concrete contains absorbing stories relayed in Ashley’s characteristic breathy and rambling style. It would appear we’re inside the head of an old man ruminating about past loves, situations, and eternal conundrums. Solo-vocal raconteuring alternates with what seems like stream-of-consciousness rambling from the vocal quartet. The stories and their delivery engage one’s attention, but the work lacks the mysterious transformation of the more durable Now Eleanor’s Idea. Jo KONDO: Hagoromo (1994). Teresa Shaw (mez-sop), Tomoko Shiota (narr. ), Sebastian Bell (fl), London Sinfonietta, London Sinfonietta Voices, Paul Zukofsky (cond.). Musical Observations CP2 117 (http://www.musicalobservations.com/). An icy single act is derived from a Noh play about a fisherman who finds an angel’s mantle and, before returning it, bargains to see her dance. The recording preserves moments of silence specified in the score for the stage action as pregnant gaps that frame narration and music. The orchestra delivers mostly massed tapered chords, dissonant slivers through which either poised singer or flute meanders, accompanied by mild ostinatos or accented lines. The overall effect is ephemeral and granitic: a Stonehenge, so to speak, disappearing into the fog. 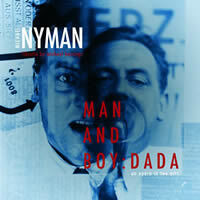 Michael NYMAN: Man and Boy: Dada (2004). Cast includes: John Graham-Hall, William Sheldon, Vivian Tierney. Michael Nyman Band, Paul McGrath (cond.). MN Records MNRCD 101-2 (2 CDs) (http://www.mnrecords.com/). Distributed in the US by Naxos (http://www.naxos.com/). 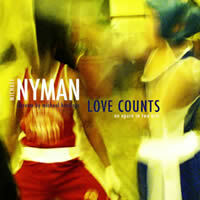 Michael NYMAN: Love Counts (2005, rev. 2006). Cast includes: Andrew Slater, Helen Williams. Michael Nyman Band, Paul McGrath (cond.). MN Records MNRCD 111-2 (2 CDs) (http://www.mnrecords.com/). Distributed in the US by Naxos (http://www.naxos.com/). Man and Boy: Dada unfurls agreeably on recording. Set in 1940s London, we see imaginary scenes in the life of sometime Dadaist Kurt Schwitters, displaced in England, interacting clumsily with a war widow and her young son. Portrayed as an artistic misfit, Schwitters and the boy intersect while attempting to grow their bus ticket collections. Nyman’s pop-tart minimalism pairs well with this opera’s milieu, a bruised Britain pulling herself back together. Right from the opening moments, there’s a memorable motive, like a taunt, which represents Schwitters’ naïve, anti-establishment demeanor. Love Counts is a different matter entirely. The improbable plot centers on an illiterate, washed-up boxer hooking up with a divorced mathematician who teaches him to identify numbers. The orchestral work lacks subtlety and variety. The staccato vocals centering about single pitches seem ill-matched with the text, the singers sounding largely out-of-range and strained. Where earlier Nyman feasted upon Purcell and Mozart, J.S. Bach’s chorale harmonizations hide behind these scenes to less winning effect. Nyman seems tired. In Man and Boy, it’s easy to see that he was piqued by a personal resemblance to the youngster and the promise of fun with Dada. What edge-dwelling composer wouldn’t want to emulate Schwitters’ Ursonate? Alas, Love Counts registers zero. 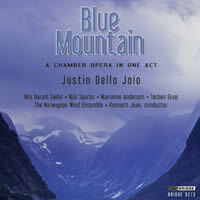 Justin DELLO JOIO: Blue Mountain (2007). Cast includes: Njål Sparbo, Marianne Andersen, Torben Grue, Nils Harald Sødal. The Norwegian Wind Ensemble, Kenneth Jean (cond.). Bridge 9273 (http://www.bridgerecords.com/). This compact, one-act chamber opera chronicles a confused and dying Edvard Grieg’s encounter with the young Percy Grainger. Grieg frets that, once he’s gone, interest in his music will languish. Despite doctor’s orders, the two musicians visit the mountain of the title, a place where the Norwegian once found inspiration and rejuvenation. Commissioned for the Grieg centennial and premiered in Norway, Dello Joio’s wind writing (with percussion, one violin and one bass) is brisk and resourceful. Grieg’s music is kept to a minimum, though a recording of Grainger playing Grieg’s Piano Concerto is cleverly embroidered into the texture. Unremarked in the booklet, pitched percussion in the mountain-top scene reminds one of the Australian’s The Warriors. 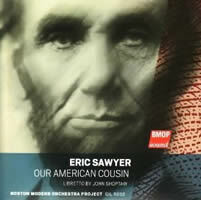 Eric SAWYER: Our American Cousin (2007-08). Cast includes: Janna Baty, Alan Schneider, Aaron Engebreth, Drew Poling, Donald Wilkinson, Angela Hines Gooch, Tom O’Toole, Hillarie O’Toole, Janice Edwards, Daniel Kamalic. The Amherst College Concert Choir, Boston Modern Orchestra Project, Gil Rose (cond.). BMOP/sound 1006 (2 CDs) (http://www.bmop.org/). Librettist John Shoptaw’s concept deserves investigation: Lincoln’s assassination told from the actors’ perspectives. (Our American Cousin was the play staged at Ford’s Theatre that fateful day.) Unfortunately, the conception suffers from unevenness, no fault of the lead singers who ply their roles with determination. An early scene for chorus ruptures the flow, and the pacing disintegrates utterly at the point of Booth’s deed. The best moments are the play-within-a-play bits of Tom Taylor’s 1858 original, along with scripted reactions. BMOP treads cautiously through a score that incorporates “Hail to the Chief” and other period tunes.